Dominic Bradbury's Modernist Design Complete (which will be published next month) is the fourth in a series of comprehensive design surveys from Thames & Hudson. 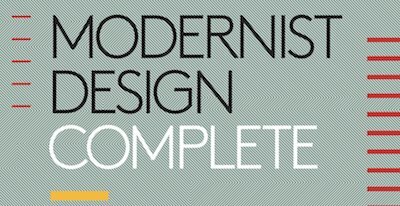 Like its predecessors - Mid-Century Modern Complete (also edited by Bradbury), Art Deco Complete, and Postmodern Design Complete - it includes profiles of major designers alongside essays on furniture, lighting, graphics, ceramics, and industrial design. There is some overlap with Art Deco Complete, as Bradbury recognises in his introduction: both books discuss the Streamline Moderne style, "which crossed the boundaries of both Art Deco and modernist design". Christopher Wilk's Modernism explores the cultural impact of Modernism, and the second volume of Victor Margolin's World History of Design is the definitive global history of Modernist design, though Modernist Design Complete is a (primarily) visual survey of the movement, with hundreds of colour photographs.